A writer, teacher, and artist, Amber aspires to integrate all that she’s learned through poetic writing, poignant teachings, and soulful portraiture. 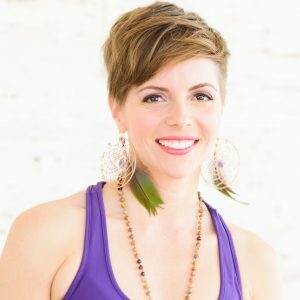 Amber credits yoga with breathing her back to life and helping her to heal. Her introduction to meditation began at the precocious age of 8, when her father brought home guided meditation cassette tapes. She and anxiety would trudge through life together until college when a psychiatrist recommended she try yoga. Through divorce and depression, anorexia and alcoholism, back pain and a broken heart, as well as other ailments in between, yoga’s walked with her. Yoga continues to save her daily, so she shares the practice far and wide, inviting her students to heal one breath (and handstand) at a time. Having trained with Elena Brower, Ana Forrest, and Judith Lasater, Amber’s style is as eclectic and complex as she is. Integrating meticulous sequencing with thoughtful alignment, she weaves inspiring flow with authentic spiritual teachings. Through laughter, frequent sweat and grateful tears, you can expect to heal your heart, ignite your soul, and return to truth. To learn more about Amber, visit her website, Instagram or Facebook.